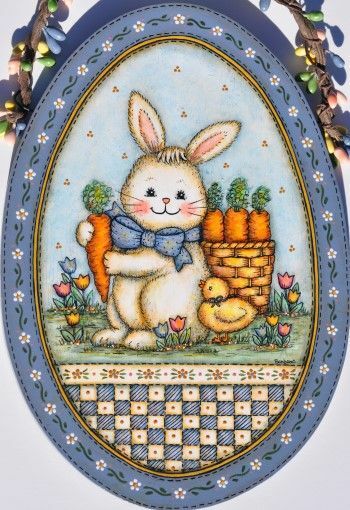 Featuring a bunny with carrots and a baby chick in a garden of tulips with blue and white checks on the bottom area. It is surrounded by a blue border with white flowers and is painted on a 5 1/2” x 8” wooden egg shaped plaque. I made a hanger by weaving some spring colored pip berries onto a wire hanger or you could just put a hook on the back.